I love it when you make something and it turns out exactly as you envisioned it. I’ve been wanting to make a primitive style wall cupboard for awhile. I wanted something that I could openly display things inside, and wanted to use metal mesh I already had on hand inside the door. I didn’t want to buy new wood to do it. I knew it would cost less to wait until I came across something old and cheap and would look better when finished as well. A few weeks ago I got an old wooden crate at a thrift store for $2 and I already had a wooden frame to use for the door, but it was too large, so my husband cut it down to size and put it back together to fit my crate. I cut some metal wire mesh to fit inside the frame, but the wire isn’t old, and I wanted it to look old. It’s been sitting outside in the elements for several months and had started getting little spots of rust, but I wanted it a little older looking and wanted to get rid of any of the shine it originally had. Normally, I would light up a small bonfire in my yard and throw the metal on it to make it rust and “age” quickly, but we have snow and it was horribly windy, so I set it on the burners of my gas stove instead. That did the trick – I just had to keep moving it around. If you decide to burn wire to make it rust, just make sure not to burn it for too long, or it will rust so much it will become brittle. I painted the crate and frame using Blue Minerals Chalk Paint Powder, and once it dried, I stapled the wire mesh inside the frame. I didn’t have any old hinges that would fit my cabinet, so I used new ones. I burned them on the stove too. It took the shine off of them, but the metal is too thick to get a rusty look, so I just painted over them after adding them to the primitive wall cabinet. I added an antique date nail to use as a knob. I pre-drilled a hole that is a little smaller than the nail, so when I pounded it in, it would fit tightly. I have these nails available in sets of 5 in my shop here. I also added a side latch to keep the door closed. The latch was removed from the wall clock that I took apart and shared last week. I like using a variety of textures with the backdrop of painted wood, so I’m displaying ironstone pieces with tarnished flatware and rolled antique book pages inside them, and I tacked 2 tiny nails into the upper corners to hang a vintage crochet doily on. Aside from the crate and hinges, I had everything on hand that I needed and I’m thrilled with my new primitive wall cupboard! Love this, Angie! It looks fabulous. It’s a great little cupboard! You worked hard but the final result was worth it. It looks so old and fits in the kitchen perfectly. I so adore this piece. Thanks so much for sharing…. Oh so cute! Love little cabinets like that; the hardware wire makes it even more antique looking. Lovely ideas! I love how creative this is! Just perfect!!! Primitives are my favorite! 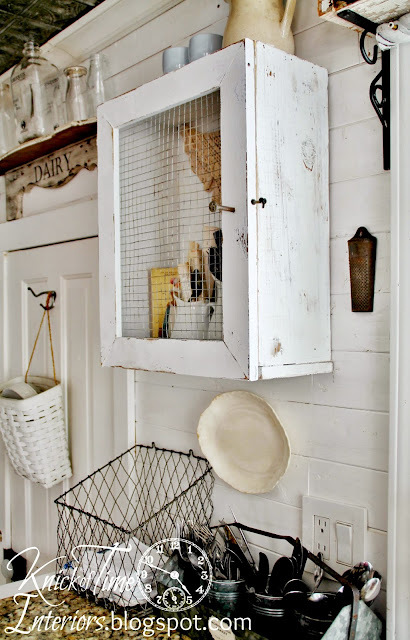 I love the cabinet and I adore the ironstone and crochet piece! It’s fabulous! Well Angie … If you had not told us how you made it, I would have thought it was an old primitive piece. Looks great with all your neat display pieces. You did good as usual. Beautiful!! Love how you made this. Fabulous, Angie! I love it! Angie, this looks so cool! And it looks like it has always been that way. Was at the antique mall Saturday to get monthly payment and Bobbie said that she may have a booth coming available for you soon! If you wait you will find the right piece to refashion! I love, love, love it. What a great way to get the look you wanted. it looks amazing. I love it….that is just to cute. I LOVE this Angie! That numbered nail is the perfect touch!! Angie, I love it! It looks so primitive and I love the numbered nail! Thanks for sharing with SYC. Forgot to mention, thanks for the burning tip. I would not have thought of that. Love your little cupboard. I have something that might look cute with chicken wire added. Thanks for the inspiration. Hi Angie, just hopping by to let you know that I will be featuring you at SYC later today. You vintage cupboard looks wonderful…great job. Love this cupboard. Such a creative idea. I think I need one too. Every time I see your kitchen I want to rip mine out throw everything away and start all over again! I have a bad case of kitchen envy. Which I will just have to live with because I don’t have the space you have, This cabinet is brilliant! I keep missing your posts so I guess I’m going to have to subscribe now. You’re my hero. Now that’s lovely… I will definately try burning my wire in future too – until now I had been dabbing on a little paint & sanding but I will try it with my metal bird cages and see what happens…! Love your overall look. Thanks, Dawn. That’s adorable Angie! Isn’t it funny how we go to such lengths to make something look old?? I do too. I love your look!